A version of Redsn0w has been released to jailbreak iOS 5.1 tethered. While easy to do and easy to reverse, be sure to understand the difference between a tethered and untethered jailbreak. Put simply, tethered means the device must be connected to a computer to boot properly and become usable. Some consider this annoying and therefore it is not always recommended. 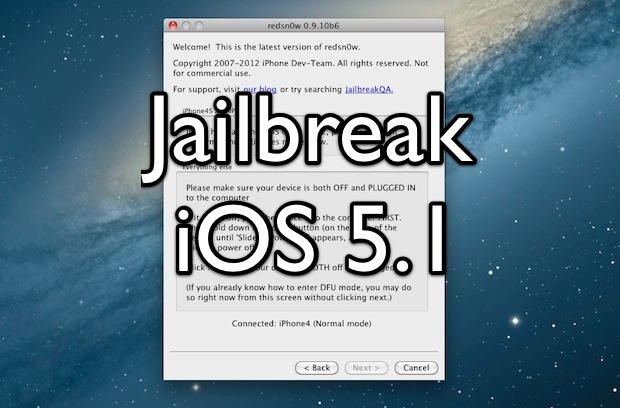 Notice that iPhone 4S, iPad 2, and iPad 3 are not supported by this jailbreak. 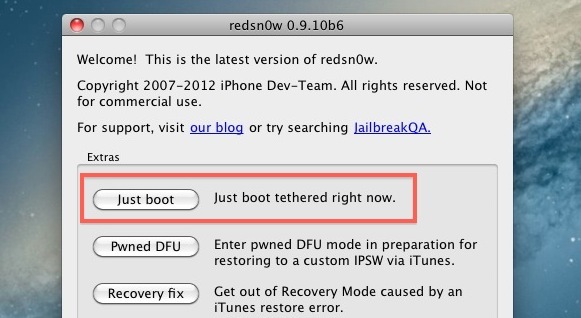 Every time the iPhone, iPad, or iPod touch is turned on or off it will need to be booted using the Redsn0w tether. This means if the battery dies or the device is rebooted for any reason, you will need to connect the iOS device to a computer running Redsn0w and choose the same “Boot Tethered” option from the Extras menu. If you jailbreak and have the white Cydia icon this means you did not perform a tethered boot, launch redsn0w and do so to resolve that. Currently iBooks does not work either, if you’re in the midst of reading a page turning novel you may want to avoid this jailbreak for the time being.